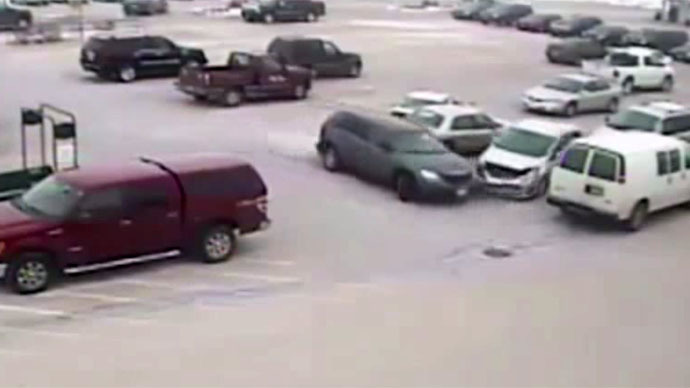 A 92-year-old man in Wisconsin made headlines after a video surfaced of him hitting 9 cars in a supermarket parking lot, but officials said he will not be cited for the incident. The surprising event was captured on surveillance video and police said that type of behavior is usually seen when drivers are trying “to elude police or in incidents of road rage.” In Russell Kerr’s case, however, his foot reportedly stuck to the accelerator and he panicked. Wisconsin police said Kerr won’t be cited for losing control of his vehicle last Friday in the Piggly Wiggly store parking lot, reported local ABC Channel 12 TV News. In the surveillance video, Kerr is seen accelerating into one car and reversing into others, ricocheting from right to left and away. When he first accelerates into a car, it causes a chain reaction of vehicles backing into each other. Then Kerr is seen speedily reversing and accelerating before turning out of the parking line, clipping two more cars before smashing into a pick-up truck. All in all, a total of nine cards were hit. Two of them were occupied but no one was hurt. “I can tell you in 23 years of law enforcement, I've never seen anything like this,” Mayville Police Chief Christopher MacNeill told WISN-TV. In this incident, Kerr’s foot had gotten stuck on the accelerator and he panicked. Police don’t have the power to take away the elderly driver’s license, but a report will be sent to the Department of Motor Vehicles, which will determine whether Kerr needs to be retested. A retest for seniors usually involves them undergoing a basic vision test. If deemed necessary, the DMV could ask Kerr to undergo a medical examination to rule if any medical conditions could interfere with driving. National Highway Traffic Safety Administration data shows that 17 percent (5,560) of all traffic fatalities in 2012 involved people 65 and older, an increase of three percent over 2011, according to Yahoo News. There were 214,000 people aged 65 and older who were injured in motor vehicle traffic crashes, a 16 percent increase from 2011. While the number of crash fatalities decreased by 3.1 percent overall in 2013, fatalities among those 55 and over increased.